Back with another review, this time its a product that has been so hyped up in the beauty community. I felt like I was missing out by not trying it but did it live up to the hype? EOS (Or Evolution of Smooth) lip balm is a spherical lip balm containing all natural ingredients that are not only good for you but for the environment, I suppose! "eos lip balm is 95% organic, 100% natural, and paraben and petrolatum free. Packed with antioxidant-rich vitamin E, soothing shea butter and jojoba oil, eos keeps your lips moist, soft and sensationally smooth." I'm just a little confused on how something is 95% organic and 100% natural. If it is all natural then isn't it all organic? How can something have 5% be inorganic but be natural? If it is inorganic than it is not organic and natural. It just doesn't fly with me! And why bring up petrolatum? The most classic form of lip treatment is Vaselline also known as petrolatum jelly. I'll get back to this in the formulation. Ok. I'll just say it, I feel like this did not keep my lips moist, soft and "sensationally smooth" in fact I felt like it was a bit too stiff to glide onto my lips and what product there is, did not sink it, rather is stuck to the surface. Remember that great claim they made that it lacked petrolatum? Probably why I don't find it smooth. Yes it is an oil but its what makes many, many, many, almost every freaking lip balm work. It sinks in. 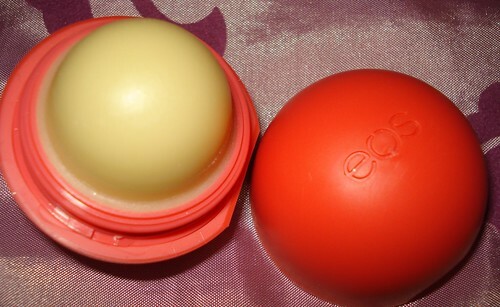 Here is why I think its not in the formula, it would mess up what EOS lip balms are known for. Think of how permeable regular chapstick is, it will melt super easily if left in hot conditions. And to help it prevent from becoming a hot mess, that's why we have in tubes or little tubs. It needs something to help it keep its shape. EOS uses coconut oil which, I'm guessing, is in place of petrolatum. Coconut oil can withstand higher temperatures and thus letting the lip balm be able to keep it spherical shape without having to worry about gravity and heat pushing it down and making a mess. The packaging, like I said before, is what makes this balm stick out! Its a cute little ball of balm! I bought mine in the pink one, "Summerfruit". I was able to find mine in CVS. I know other drugstores carry it too! I have yet to see it in a Target or Walmart type store. But I do know it is also available on drugstore.com and other drugstore's websites! The prices range from $3 - $5. I don't think I'll be buying this again! It just didn't do anything for me, nothing that made me think "WOW! My lips are smooth and moist!". If you're like me and battling dry, cracked, winter lips I would suggest Nivea's "Kiss of Moisture" I love them, they feel amazing and really soak in! And a couple bucks cheaper than the EOS! 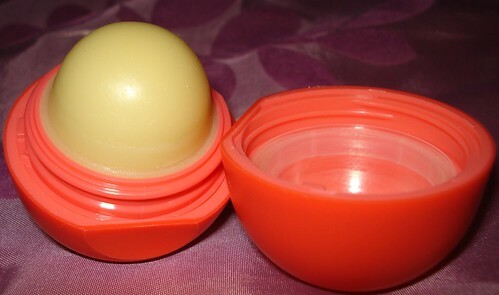 Have you tried EOS' lip balm? Love it? Like it? Hate it? Let me know :) Also, what do you do for dry/cracked lips?! "Natural" and "Organic" aren't interchangeable. 100% natural would imply that the product's ingredients are free of chemicals or synthetic blends. All of the ingredients are "natural" - essential oils, herbs, fruit extracts, etc...95% organic would imply that of those 100% natural ingredients, 95% of them are organically produced. Products that are organic are produced without pesticides, hormones, etc... Petroleum and mineral oil actually keep ingredients from sinking in. It doesn't allow the skin to breathe. It sits on your skin and doesn't let anything in or out.